If you are looking to host a spectacular wedding event in the Greater Toronto Area, I would highly recommend the exquisite Graydon Hall Manor. Established in 1936, the building is magnificent and unique with its timeless architecture and grand grey stone walls. This historic and elegant building is not only stunning from the outside, the service of the staff is always incredible and will meet your highest expectations. Every event we have attended at this venue has been well-organized and planned perfectly, down to the smallest details and decor. This banquet is one of the best places to shoot a wedding in Toronto, and this applies year-round. Whether it's a warm day in the summer or a cooler winter evening, the manor always seems to provide the ideal setting. One of my personal favourite features of the venue is the front courtyard, which is the entrance to the hall. The luxury archway surrounding the front door makes for a romantic backdrop with a bride and groom in front. In this case, we were able to bring the groom’s sportscar into the font area. 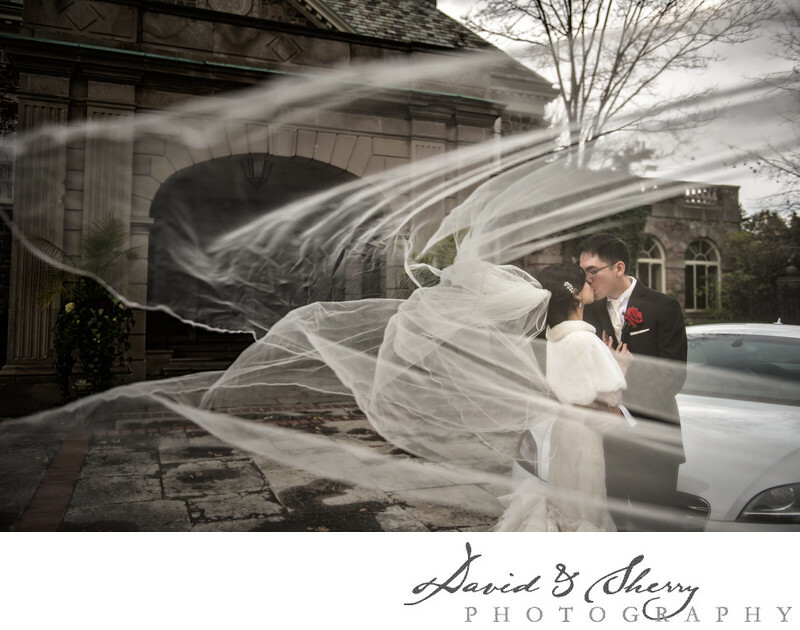 Although the weather was cloudy and slightly windy, we were able to use the wind to our advantage with the bride’s flowing veil. The cloudiness of the day also gave Graydon Hall a moody and rustic look. Location: 185 Graydon Hall Drive, Toronto, ON M3A 3B1.